For 100 years, the not-for-profit State Compensation Insurance Fund has served California as a strong, stable provider of workers’ compensation insurance. Established in 1914 by the state legislature, State Fund is a vital asset to California businesses and employees; its history parallels the dynamic, influential, and innovative history of California itself. 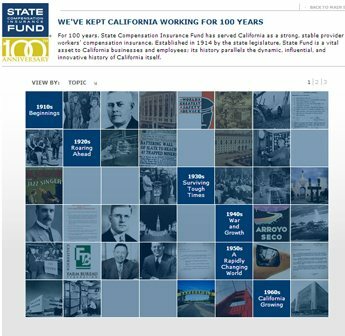 To celebrate that history, State Fund commissioned an interactive Web timeline that highlights the growth and achievements of the organization and the Golden State. The timeline offers users two ways to browse: by chronology and by themes that include Origin & Purpose, Essential Services, Growth & Success, Working at State Fund, Changing Economy & Changing Workforce, The Home Office & More, and Leadership & the Road Ahead. The home page. Visitors can browse by topic or year. 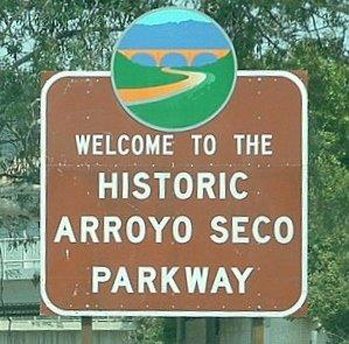 The timeline also features milestones in California’s history. 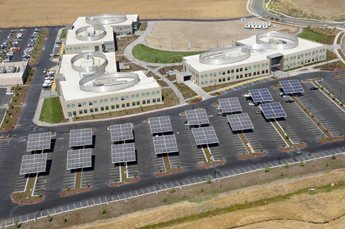 Solar panels on SCIF’s Vacaville campus help tell the environmental story.